Fortnightly BCS check and blood sampling work involves both the farm and research tech team, 19th July. 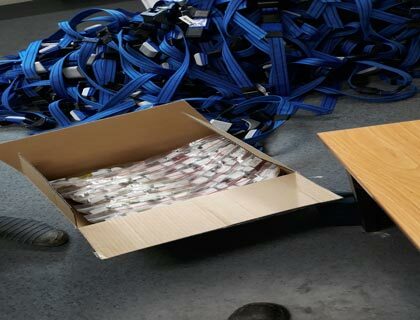 SDH cow collars assembled and ready to be allocated to the herd. 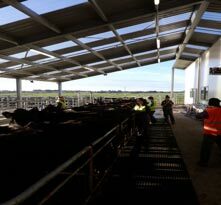 In the figures above the early calving groups calve between 25th July and 24th August with the late calving groups being all animals calving after this date. Solid bars are for mixed age cows (including R3’s), hashed bars are R2’s. The BCS range of the fodder beet herds is greater than the kale herds with mixed age cows ranging from BCS 4 to 6.5. Within the fodder beet mobs there are 7 cows (total of 377 cows on beet) still at BCS 4 which is disappointing given the feed allocations that have been targeted. All but one of the BCS 4 cows are due to calve before 25th August making it difficult to put much condition on them before calving. Options are being considered to pull them off crop and put them onto pasture. The PKE will be finished on Thursday this week so from Friday onwards all kale herds will be offered kale and baleage. Because of the good BCS gain in these herds the ME allocation will be reduced to reflect this with an MEI of 118 being targeted in these mobs. 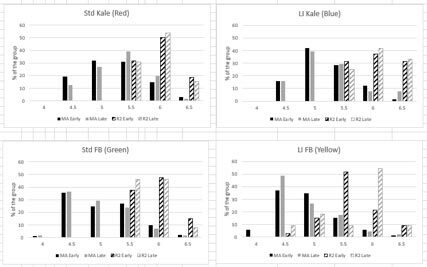 Initial calculations indicate that there is enough kale remaining to feed all kale cows at the proposed levels – 9.5-10.4 kg DM/cow/day for another 35 days however the kale feed budget is currently being revised based on the calving spread so this will be reported next week. APC across the farmlets continues to increase with growth rates between 7-10 kg DM/day in the last fortnight. Crop paddocks for next winter have been identified and will be used for springers and to protect grazing areas during really wet periods. Crop yields have been measured this week with results available next week. Leaf yields on the fodder beet has been reduced due to hard frosts earlier in the month. 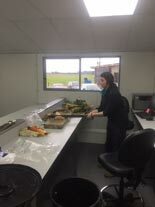 We welcome Caitlin Crack to the team as a new DairyNZ research technician to assist Nicole S. Hammond on farm, welcome on board. We also welcome Uere Kaarere to the SDH farm team on a permanent basis after starting here on a casual basis through Enterprise Recruitment and impressing us with his start on farm. Great to have you on board to join the team.